This page is a guide to Torrevieja’s best bars, nightclubs, pubs and shows. We look at what to do and where to go at night in the large tourist resort of Torrevieja on Spain’s Costa Blanca. Where are the best bars in Torrevieja? What are the best nightclubs in Torrevieja as well as venues and acts? 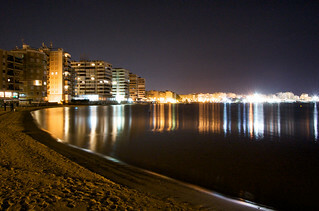 What is there to do at night in Torrevieja? Where are the best pubs in Torrevieja? Where is the best place to meet women/men/girls in Torrevieja? How much do drinks cost in pubs, clubs and bars in Torrevieja? Torrevieja is the largest tourist resort on the Southern Costa Blanca and comes second only to Benidorm when it comes to its nightlife. Torrevieja is known for its marina and beach with has all the amenities you can expect from a first class resort. Visitors flock to Torrevieja all year round because of its climate and Torrevieja also has a fair number of expats who have made this picturesque sea side resort their home. The summers are long and hot, while the winters are mild and the in between seasons can best be described as being almost like summer. The main area of activity in Torrevieja is its beach front and promenade as with all the Costa Blanca resorts this is teeming with bars, pubs, restaurants, ice cream parlours, night clubs and beach boutiques. The Old Town and resort centre also has its fair share of activity. One of the most popular places to enjoy the nightlife in Torrevieja is the Keeper Bar. The Keeper Bar is situated at the Harbour Wall and is a very busy locale as it has one of the few webcams in Torrevieja and many people come to the Keeper Bar to see and be seen. Jaima Del Puerto is situated in Las Salinas. Jaima Del Puerto is the place to celebrate your birthday or your hen and stag dos and they have a whole host of activities that you can tailor make your programme to. You can relax on their sofa type beds from ten in the morning until four the next morning much in the style of those fancy beach clubs on the Costa del Sol. 222 Garden Tropic is the best place to visit if you are down at the beach, At the 222 Garden tropic you can enjoy pizza beer, ice creams and cocktails and live entertainment as well as a good choice of music. Oz offers foam parties on Fridays and is open from every Wednesday through to Sunday. Oz has the VIP area and a roof terrace. Oz is the same venue as Pacha Torrevieja but was closed down for a while and has now opened its doors as Oz, and has very much kept the same kind of music and entertainment for clubbers to enjoy. The club opens at midnight and closes its doors at seven in the morning. Do not quite expect the glitz and glam of Pacha Ibiza as that is more of an international crowd. Oz Torrevieja is the firm favourite of Spanish locals and only becomes more cosmopolitan at the height of the season. Don Angelo Divas is a good place to celebrate birthdays particularly popular with expats and locals, and hen and stag dos also popular with expats. Don Angelo Divas opens its doors from six in the evening and shuts its doors at four the next morning. The KKO Torrevieja is a disco which has been in operation since the early 1990´s. This venue is a great place to dance the night away, with international Djs making the club come alive with their different beats and tastes. Love Discotheca has been open for more than two decades and night revellers can dance the nights away every weekend of the year. Torrevieja on the southern Costa Blanca has the most nightlife in the area and if that is not enough then Benidorm nightlife with it’s with more than one thousand bars, pubs, restaurants and clubs is only an hour away by car.